Can Am. 1972. Donohue. Porsche. Mosport. Mosport is a great road circuit that I used to go to in the mid-'70's. Saw Can-Am cars like these and the last F1 race there. This video turned up in my YouTube feed. Something to watch as we wait. What a fun video. I love that generation of race cars. Very exciting times. Thanks Bikerjulio for finding and posting the video. We are very pleased for you that you had those unimaginable experiences! And now we see where our forum name came from. VERY COOL! 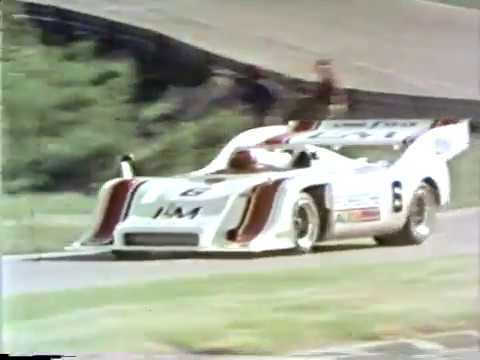 Those old CanAm cars were incredible. Especially considering how limited the technology was compared to today, they were absolute monsters on the track. Is that a Lola, or....? It was a Huffaker kit, very close to the Huffaker Genie. Built L-88 big block with Mondelo Open chamber square port alum heads, Holley 950, 3 barrel carb, McKee transaxle. Fast and dangerous. and of course,,,,,,,,,,,our first,,,,,,,,,Mid Engined Chevrolet. Last edited by Racer86; 10-24-2018, 07:22 AM. Monster is a good term for these cars. Somewhat evil handling, but they taught you throttle control. No traction control other than your foot. We are about 1720 lbs, with 670 horsepower. Aero at that time was still new stuff. Front end lift was a huge problem, ( blowovers) I lifted the front end about 2 feet at turn one at Laguna Seca, and ended up backwards on the outside of turn 2. But, at 23 years old that was cool. now thinking about it, I just shake my head and thank god my angels could drive as fast as me. technology today is amazing. I have run faster than the 1970 Can Am car ,in our Radical SR-3 with a 1500 cc Hayabusa engine. That is about 93 cubic inches. Sold the Can Am car and bought a sailboat. Later returned to car racing but with more knowledge. These cars were inspiring. Then, and are so even now.